I have a love/hate relationship with cleaning. I love things to be clean. I hate/dislike cleaning them over and over again. Sigh... But it must be done. I have been trying really hard to delegate as much of the cleaning as I can to my kids as they are getting older, but they seem to make more messes than they clean up. My main areas of focus in my home are the kitchen, living room and bathroom. If those areas are clean I can at least function. The school room and bedrooms are often sadly left neglected till they are so bad that I finally get everyone together to help do a big deep cleaning of them. Spring seems to be the official season of cleaning and I admit my house could use some deep cleaning. I thought if I made a list of all the areas that often get overlooked it would hopefully motivate me to clean them. Because let's face it with 5 kids the state of my house is in mostly survival mode. I am just going for liveable these days. One day my house will be immaculate and dust and dirt free, but probably very quiet. So for now I'll do what I can and learn to live with and even love the chaos. It's pretty sad to admit but I usually only do deep cleaning when I am 9 months pregnant and in full force nesting mode. So that means that I have only deeped cleaned my house every 2 years. I am due for another baby! Since God hasn't seen fit to give us one as of yet, I am going to have to will myself into giving our house a good deep cleaning because it really needs it! 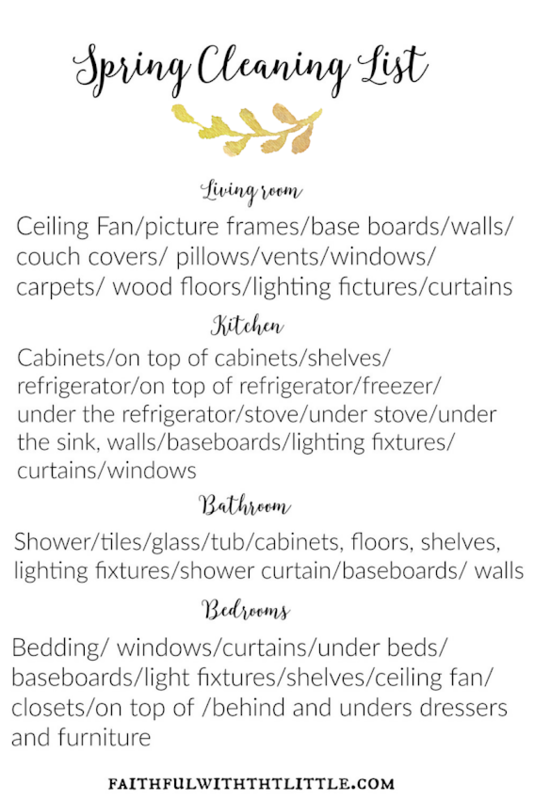 I have listed all the areas in my home that I am hoping to tackle room by room. Some of the things I have listed are usually overlooked and others areas are cleaned more than others, but I thought it would be good to just list them all. Whether it be dusting, scrubbing, using some good ol' elbow grease or organizing; I think it's safe to say that these are all defined as cleaning. I hope you will join me as I attempt to spring clean and we can motivate each other! Happy Cleaning! Be sure to check out all of my natural cleaning products! Do you have certain areas in your home that you focus on? How often do you deep clean? Do you have a love/hate relationship with cleaning also? I just shared your printable with my readers on this week's 52 lists about Spring cleaning :) Thank you! Hi Rebekah, Great to do list, lve the font too. Thanks for sharing on the #SmallVictoriesSundayLinkup this week! Pinned and shared to FB. Love this! I feel the exact same way about spring cleaning. But I thrive with lists! Yes, lists are my favorite! I have a cleaning checklist that I do daily but I don't have a spring cleaning checklist yet! This is awesome. Thank you! Oh good, hope it's helpful! I enjoyed my visit here today, may all that you set your hand to be blessed! Aww.. thanks so much! Sometimes I really have to be in the mood to deep clean! You made me smile. I know I need to get busy on this stuff. This is a great reminder to keep handy - it has all the places we forget (or overlook) like on top of the refrigerator, vents, baseboards and more. Thanks for sharing at Mom-to-Mom Mondays.